The public has yawned at the coup d'etat that is unfolding throughout Illinois. First, there was Cook County President John Stroger's stroke in March, before the local primaries. The long term Democrat was being challenged by a younger board commissioner. But the party machine and black voters vocally pistol whipped Stroger's challenger into not speaking ill of the sick. It was the most silent campaign in history. No one saw Stroger since his stroke. His family has guarded his secrecy like the gold in Fort Knox. Which in county political capital, the same thing. But as the weeks went on, party leaders and other board commissioners grew wary of the lack of communication on Stroger's condition. Will the President return to his duties? Can he campaign against an aggressive Republican challenger in the weeks before the November election? As less and less information was forthcoming, the power brokers began to get restless. When the Stroger family began to make hints that Stroger wanted his son to succeed him, the power brokers began to salivate at the opportunity to seize another $ 3 billion dollar government budget, with fat patronage contracts to be doled out. Fat patronage jobs with now fatter public pensions is the bright flame for all the political moths, no matter the party affiliation. But one thing Mayor Richard J. Daley had was the sense of loyalty to old school machine politicians that his father, Richard J. Daley, had welded into an unstoppable street army. But after giving the family two months to make a decision, even the Mayor decided that an interim county board president would be a good idea. He quietly touted his brother, John, for the job. Once the prospect of a long serving clout position had a potential vacancy, it was like blood on the water and the reef sharks began to circle. The Stroger family put its spin into high gear; tapping long term black Alderman William Beavers as its spokesman. He outlined a succession plan as pay back for Stroger's long and loyal service to the local Democratic party: Stroger's son, Todd, would take his father's county board seat, Beavers would take the county board president's seat, and an aldermanic seat in the Chicago city council would go to Beaver's daughter. This is the worst form of political nepotism. It is a galling trend of career politicians who believe that the office they hold is their personal property to passed along to family members like an inheritance. The voters have been shoved aside like the peasant serfs in feudal England when the nobles decided to realign territory among the knights of the inner circle. Now this succession planning is like the transition in the former communist Soviet Union. The party leader would get sick; he would be hidden from public view; the world was told that the leader still has all his mental faculties; then suddenly, his right hand men take power with the alleged permission of the recovering leader, who then abruptly takes a turn for the worst and passes on. The Stroger family called a press conference to announce Stroger's final decision on his political career. Moments before that press conference in the last week of June, the family canceled it without explanation. Three days later, on the Friday afternoon before the holiday weekend, the family issues a five page press release saying that Stroger would resign his post on July 31. 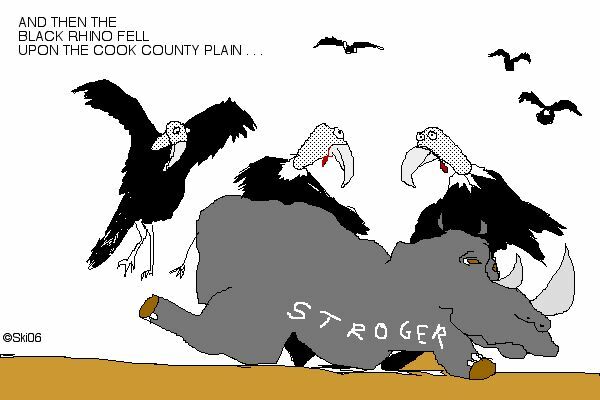 This was a change in the original reports earlier in the week that Stroger was only thinking of quitting the race to be reelected in November, thereby keeping his board seat and presidency of Cook County. But during the time frame of the aborted press conference and the weekend press release, the gears of the political machine began to make sausage of the Stroger family plan. No agreement between the power factions. The palace coup is turning into a battle royale. The black community believes the Stroger seat is their entitlement. The black leadership are still thinking that its power bloc in 1960s terms. Commissioner Bobbie Steele and Congressman Danny Davis both have thrown their hat in the ring for it. With Todd Stroger seeking the Democratic party committeeman's approval to replace his father on the ballot, there is an old fashion cigar filled back room film noir knife fight in the works. Every candidate is going to be calling in political favors. There could be a possible write in candidate. There will be hurt feelings. Demographically speaking, the black population ranks about fourth behind the growing Hispanic and Asian populations. There is a power vacuum that everyone is rushing to fill. The Democrats lust for power could splinter the vote so much that the seats could be lost all together. But the whole deal is keeping or taking more power. The Cook County Clerk, also a Democrat, opined that the delayed announcement of Stroger's resignation was a way to keep any third party candidates off the ballot, as the deadline expired just a week earlier. Beavers called the clerk a little poop. The delay did freeze out potential independent candidates. But it also increased the fury over who will really take the place of Stroger. Politics in Chicago has been deemed a blood sport for generations. The long knives are out and a nasty general election is ahead. The old Daley guard would love to have the mayor's brother to take charge of the county, even if for just a while. The Daley family then would control all aspects of Cook County government. They can bury foes, install loyalists, and hide the skeletons from increasing federal scrutiny. There are so many corruption investigations that the a casual voter cannot keep up. This election season is filled with the bold, arrogant and open political corruption which stains both parties banners. Governor Blaggovich's administration has just been hit with a multi-count, multi-agency political hiring scandal that the U.S. Attorney is investigating as the campaign begins its summer high gear. The Governor's opponent, Judy Topinka, is the last Republican regular in statewide office, a protégé of convicted ex-Governor George Ryan. The feds are still looking into all state agencies. And with every rock they turn over, they find aspects of corruption. Critics have cried that the federal authorities are attempting to criminalize local politics. Under the old system, to victor goes the spoils. It was standard operating procedure to use political influence to get family members, allies, deadbeat relatives, political organization flunkies, and campaign contributors easy high paying jobs or multimillion dollar no bid contracts. The public treasury was the political piggy bank. And everyone's fingerprints are on it. 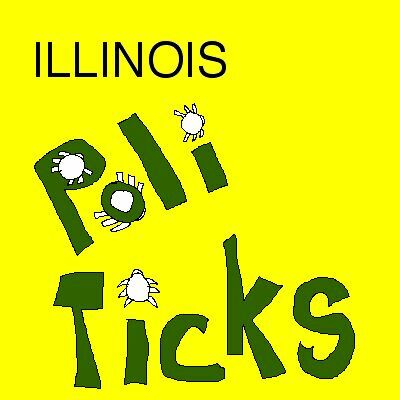 Again, the lock-step approach to dominant one-party rule in Chicago and Cook County has bred a greed machine of swarming locust sucking in billions of taxpayer dollars. But under the new system of corruption convictions, to the victor may come a subpoena or worse, an indictment. The crush of mounting public debt for less accountable public service will also cause a final taxpayer revolt. But that may come too late. Temporary property tax relief has not been extended by the State Assembly, which means that many homeowners next year could find their tax bills doubling due to exploding property valuations.